The flag of the United States is a powerful symbol that represents the nation’s history and structure of sovereignty, as well as its ideals, laws, and spiritual qualities. It is used to inspire patriotism among Americans, represent governmental organizations, and give the country a distinctive identity during international meetings. The American flag is also known as the “Stars and Stripes” or the “Old Glory”. The present design of the United States flag consists of 13 horizontal stripes of alternating colors of red and white, and a blue rectangle in the upper left corner that contains 50 white stars. The 13 horizontal stripes symbolize the 13 original colonies, while the 50 stars represent the 50 current states of the United States. Throughout the history of the United States, the design of the flag was changed a total of 27 times. The first flag, the “Grand Union Flag”, was adopted right after the Declaration of Independence was signed. On New Year’s Day of 1776, it was flown over George Washington’s headquarters on Prospect Hill in Boston. This flag had the same 13 horizontal stripes as the present U.S. flag, but in place of the blue rectangle with stars, it had the British Union Jack. A variation of this flag, called the Bennington Flag, was used during the Battle of Bennington in 1777, and it was the first flag that was used to represent the United States in battle. A new flag design was introduced on the 14th of June, 1777, and it marked the beginning of Flag Day. 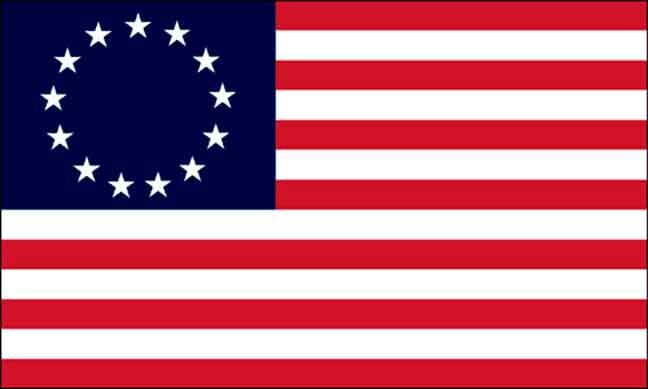 This flag was called the Betsy Ross Flag, and it was made up of 13 horizontal stripes of red and white, and a blue rectangle that held 13 white stars in a circular pattern. As more and more new states were formed, new stars had to be added, and a new pattern had to be adopted for the placement of the stars. In 1794, when there were 15 states in the Union, an act was passed to change the design of the flag. 15 stars were placed in the blue rectangle, in 5 rows of 3 stars each, and the number of horizontal stripes was increased to 15. This 15-star and 15-stripe flag became the inspiration for the composition of the U.S. national anthem, the “Star Spangled Banner”, which was written by Francis Scott Key. In 1818, President Monroe signed an act to reduce the number of red and white horizontal stripes to 13 and add a new star for every new state. This new flag was a 20-star flag. From this point onward, the basic design of the American flag would remain the same; the only thing that would be changed was the number of stars in the blue rectangle. Almost a century later in 1912, when the total number of states in the U.S. grew to 48, President Taft changed the arrangement of the stars to 6 rows of 8 stars each, making a 48-star flag. When Alaska became a U.S. state in 1959, the stars were rearranged to 7 rows of 7 stars, and when Hawaii became the 50th state, the pattern of the stars was changed to what it is today, with 9 alternating rows of 6 and 5 stars.